I plan to celebrate its tenth birthday by publishing a new final chapter. An addendum, if you will, to the book. Eventually, of course, the haze of my exhausted stupor gave way and I was forced to ask the Important Question: "What next?" Get it? Fresh-pressed? Squeezed? 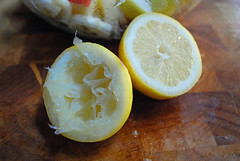 Fresh-pressed lemons for juice? This post is directed to the kind people who are now following the blog after hearing about it from WordPress's Fresh-Pressed page: THANK YOU for stopping by to read and for following. Alas, there won't be much action here for several more weeks. I'm just finishing the new book I'm writing and the blog is on hiatus (I love that word!) until I finish. I only took time for the drive-by posting about craft beer because I was afraid I'd forget it. I had no idea someone at WordPress would find it interesting. Anyway: I'll resume blogging just as soon as I finish the manuscript of the meat book. Meantime, there are over a thousand other posts here to read. So. Have at it! Not here. I'm there. Out of the country and nowhere near anything digital. I'll return in early September. Here's hoping I don't fall off a mountain. Jack Curtain was kind enough to alert me to what I had not realized: A torrent of old posts landed in the Google Reader rss stream yesterday. That wasn't intentional. As some of you know, I just moved the website to Wordpress.com. As is always the case, the move created some broken links in old posts. Yesterday I sat down to fix those (a tedious, boring task). Unbeknownst to me, Wordpress zipped every. single. fix. out into the ether --- and into Google reader as a "new" post. All 90 or so of said posts. I apologize. I don't know why that happened or how I could have stopped it. I didn't put new dates on the posts; all I did was "upate," so why they went out as "new" is not clear to me. But I also can't figure out why Wordpress keeps sending posts to Facebook even after I tell it NOT TO DO SO. --- so apparently Wordpress either has some goofball bugs (which seems unlikely) or --- there are some tricks up its sleeve that I've not yet caught on to. In any case, THANK YOU, Jack, for taking time to let me know. And to the rest of you: My apologies. So While I'm Sitting Here Wasting Time: An Update . . .
. . . on The Book. I've spent the past three weeks revising what's already been written with the aim of handing it over to The Editor (or, as we call her at our house, Saint Andrea) just after Labor Day so she will (I hope) agree that yes, we can publish this book in the fall of 2011. So. Yes. Having done that, I'm now wrestling with the current Chapter From Hell, which concerns chickens, industrial agriculture, and agribusiness (trust me: it's more interesting than it sounds) with the goal of finishing it, too, by early September so I can include it in the chapters to send to St. A. At which point, I will have written well over half the manuscript and then comes the truly hard part (which is already disrupting my sleep): researching and writing the last third of the book by December 31. If you don't hear from me again, it's 'cause I've died of anxiety. Here's hoping not.